Let me start with a simple declaration: I love cheese! Love, love, love it! I wish there was a word stronger than love to help you understand my relationship with cheese. I don’t know who invented cheese, but I think they deserve a national holiday! I love ordering a cheese plate when I’m dining at a restaurant. 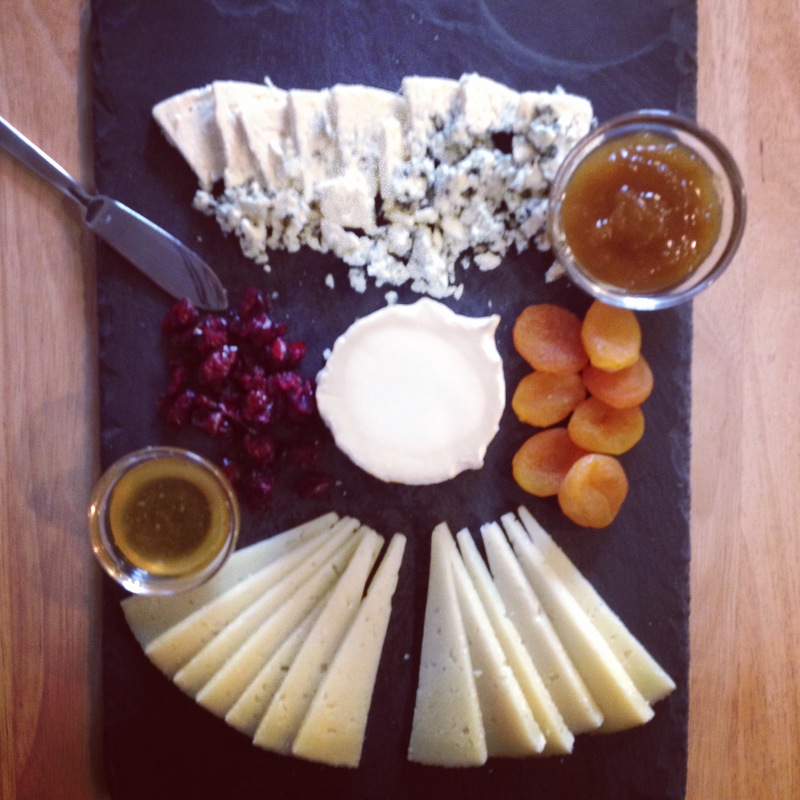 Side note: Talula’s Garden in Philadelphia has an entire menu devoted to cheese. Go there and order the “World Travel – An Illustrious International Collection”. You can thank me later. Anyway, needless to say, I love to put together my own cheese plate for small get-togethers or when friends or family visit from out-of-town. One of my best friend’s from college was visiting the other weekend with her new boyfriend, who I was meeting for the first time, so I knew a simple cheese plate to graze on would be a home run. To keep it simple, here are a few tips to ensure you create a delicious and delightful spread. 1. Select a variety of 3 to 5 cheeses. This can depend on how much money you want to spend and how many people you’re feeding (1 to 3 ounces per person is typically a good rule of thumb). I like to select cheeses that suits everyone’s palate, so it’s safe to say a blue, a soft, a hard and an aged covers most everyone’s preferences. 2. Accompaniments are a must! Jarred condiments such as jam, chutney, honey and mustard are perfect because there’s no fuss! Honey pairs great with stinky cheeses (such as blue) and jams and chutneys really emphasize the flavor of nutty cheeses (I love fig jam with manchego…delish!). Be sure to add other accompaniments as well such as bread, crackers, dried fruits, nuts, and please don’t forget the wine! 3. Serve your cheese on one large board. You can use slate or wood (a cutting board works great). Label your cheeses, this way you don’t need to recite each variety over and over again. I didn’t do this in the above photo, guilty as charged, but it was a small group and a small selection of cheeses. 4. Set the plate out one hour before serving. Cheese is best served at room temperature. Cold cheese is muted and less flavorful. 5. If you’re crazy enough to have leftover cheese, don’t store it in plastic bags or plastic wrap. It will last longer and taste fresher if wrapped up in wax paper or parchment paper.